When the weather outside is frightful, town and municipality workers have a lot to worry about. There is road clearing that must be done of course, but that’s not all. There are also skinned infields to consider. 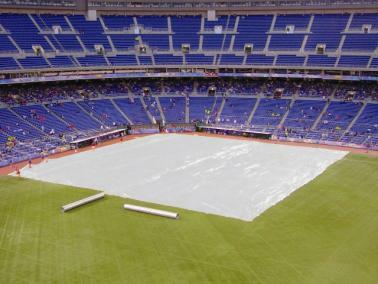 A skinned infield is an important part of anybaseball fieldand must be maintained year-round. Otherwise, the field won’t be ready for players come spring and summer. Although there are variations, mostskinned infieldsare composed of fine silt, natural sand and red or brown clay. Of course, if the soil ratio is off or the area is poorly maintained, players could end up with a variety of injuries. For example, driving rain could cause the infield to become uneven in spots, which could lead to skinned knees, broken ankles or busted hips. Understandably, such injuries could also lead to civil suits and missed baseball championships. And what town or municipality wants to deal with those things? We can’t think of any. 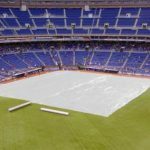 Thankfully, such problems may be avoided with due diligent and that starts with choosing the best athletic field covers. They’re designed to protect skinned infields and other heavily traveled areas from damage. But which ones are ideal for America’s best, hometown fields? First, let’s look at the average baseball field. It’s likely to have grassy areas as well as skinned ones. Some areas may receive heavy traffic and others, not so much. There’s also likely to be a variety of permanent and temporary structures in place, namely bullpens and base plates. Each one would likely benefit from some type of athletic field cover being in place, especially during the off season. We say “some type” because not all covers are right for skinned infields. Unlike their grassy counterparts, skinned infields can withstand heat, which tends to build up under high quality, athletic covers regardless of the season. As such, covers placed in those areas tend to be heavier and may remain in place year-round, if the situation warrants it. To learn more about selecting the right athletic cover for your area’s skinned infield or other play area, pleasecontact usdirectly. This entry was posted in athletic field covers and tagged athletic field covers on February 11, 2019 by Canopies Tarps.